Powers Agnes-Burma Slide Mitigation Project (OR) | WEST Consultants, Inc. The Powers-Agnes Burma Landslide mitigation site is one of a series of small landslides and soil creep locations that are active along Oregon State Highway 542 (Powers Highway) and the South Fork Coquille River. The continual movement of the Burma Landslide toward the right bank of the S.F. Coquille is being mitigated here. The goal is multi-faceted, with a geotechnical approach to the mitigation of soil creep, and revetment design along the riverbank to prevent river-based erosion of the toe of the landslide, which could undermine the geotechnical mitigation. WEST Consultants performed a historic geomorphic assessment as well as a hydraulic and scour analysis on the reach of the S.F. Coquille River in the immediate vicinity of the toe of the Burma Landslide. 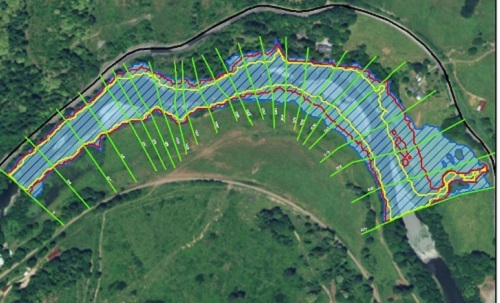 UAS imagery was used to capture high resolution imagery of the river section in question. Images of the river from that day were used to calibrate the 1-D hydraulic model based on flows measured that day, and the width of the water surface in the channel at survey cross sections. As a result of the geomorphic and hydraulic analyses, various alternatives are being evaluated and designed to slow down the slide’s movement of the toe toward the S.F. Coquille. The alternatives involve various approaches to installing drain infrastructure within the body of the landslide, as well as the construction of various soldier pile wall configurations to reinforce the toe of the slide. Hydraulic and scour analysis informs the extent to which river channel erosion might undermine the geotechnical mitigation. The key hydraulic challenge to the project is to mitigate the effect the River itself might have on the toe of the landslide. Appropriate revetment designs must be calculated and implemented in order to preserve the geotechnical applications to draining the body of the slide and reinforcing the ground at the toe of the slide.